Fall 2012 is shaping up to be a busy season for the Learn & Serve staff! We have over thirty retreats and events scheduled for this fall for a wide variety of groups. These groups are coming from all over the southeast to spend time on our campus and experience Learn & Serve (L&S) programming. This fall, we will be hosting groups for more than fifteen Urban Slum Experiences and more than ten Global Village Overnights! Along with these programs, groups will also be participating in times of worship and devotion led by SIFAT staff, appropriate technology trainings, challenge course elements, and more. Through these retreat programs, participants have an opportunity to experience how the majority of our brothers and sisters around the world live every day, and then leave with an understanding of what they can do to respond to what they have learned. The most recent L&S retreat was held for Rome First Baptist Church (RFBC) of Rome, Georgia. The wonderful participants from RFBC participated in a range of activities throughout their weekend retreat. They spent time fellowshipping with each other, worshiping, and diving into our programming. The group spent majority of their time at SIFAT in our Urban Slum and Global Village. 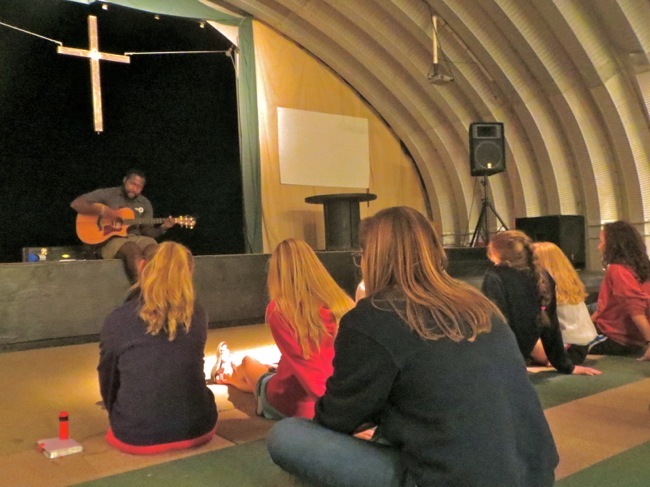 Students from Rome First Baptist Church experience worship during their first night on the SIFAT campus.